The other day I finished these fun wire wrapped ring necklaces that a friend wanted to have made for her and her daughter. 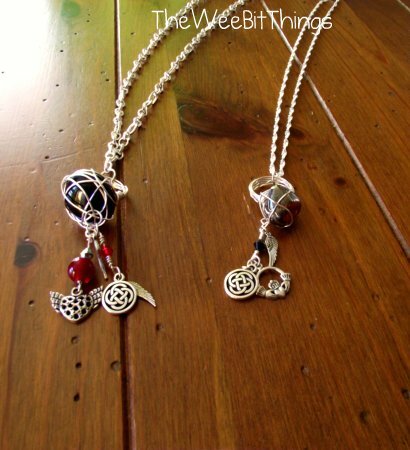 She provided the materials and I created these two necklaces. 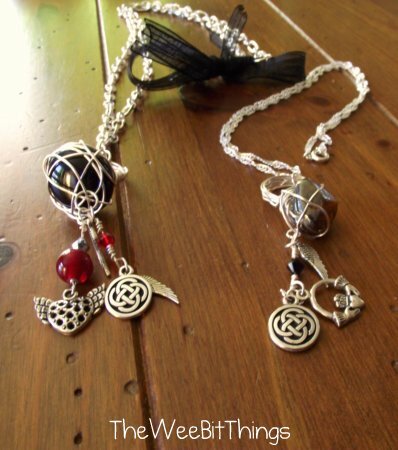 She picked out the necklace style and chose her own charms and I decided which materials to use and where to use them. When I saw the one on the right on my friend, it looked really nice on her! It’s easy to make. The most time consuming part is making the wire ring itself. Depending on the bead/stone you use to wrap the wire around it can be easier or more difficult. I used a no-hole glass bead. It was quite challenging to secure it down, but I managed to get it. The rest was a breeze.